For those of you who have not been following what I have been doing, here is a quick recap. When I came back from Pacing Break I found out that some people tried to fly the practice airplane. 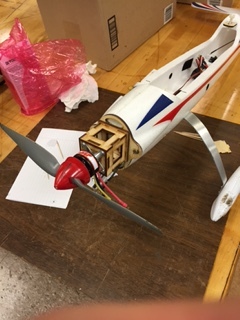 However, it was a windy day and consequently they crashed it and broke the motor mount. 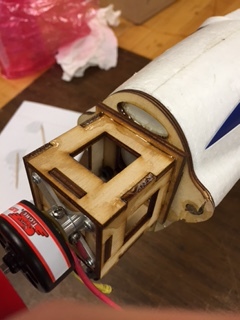 Since I could not get just the motor mount without having to buy a whole new plane, I had to create a new one. So, I went into Solidworks (a 3D drawing program) and created a model of it. This is where I left off on my last post. 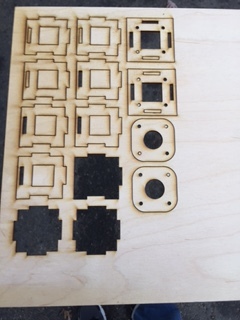 Before Thanksgiving break, I sent the material with which to make the mount (top left picture) and the computer drawings for the parts to the laser cutting staff. They cut them out and on Monday I went in and got them (top right). I spent a few hours putting it all together and gluing it. This is the result. Finally the plane is fixed and ready to fly again. 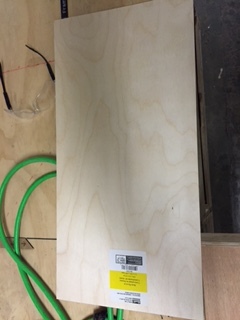 This entry was posted in Uncategorized and tagged laser cutter, Lehigh, lehigh university, motor mount, practice plane, switch. Bookmark the permalink.